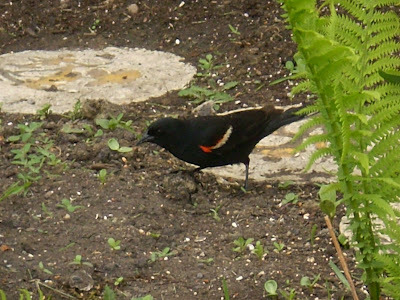 Finally got a half decent pic of the red winged blackbird! We have several coming to the feeder now, they are also finally getting used to the large amounts of noise and movement coming from our yard all the time LOL. Of course tho, this isn't the one who is amazingly red on the wings, its funny how they vary in color, there is one that is almost florescent, its red color is so bright on the wings.